If our eyes were sensitive to the IR radiation in the main CO2 absorption bands then we would just see fog. The atmosphere is opaque to CO2 at well below pre-industrial levels with an absorption length of about 10 meters. This would be a very thick fog. By adding more CO2 to the atmosphere man is just reducing a little that aborption length. The CO2 greenhouse effect is caused by the reduction in IR radiation escaping into space from the higher atmosphere of the earth. As we add CO2 so the height where the fog disperses and radiation escapes increases. The temperature is lower at these heights reducing the effective energy escaping by a small amount (Blackbody radiation proportional to T**4). The energy balance of solar input radiation to the Earth and heat loss to space by the Earth must remain in balance. Therefore the Earth warms slightly to emit a little more total IR radiation across the spectrum to compensate the small extra energy trapped by extra CO2. However the energy increase is only logarithmic because the absorption is already opaque. All these effects based on accurate cross-sections have been included in a model of the atmosphere by the US navy. The model is called MODTRAN and has been validated by direct satellite measurements. It is very informative since one can simulate what effect CO2 has on energy output for different regions and by inference how the Earth’s temperature reacts. The atmosphere’s simulated are for different regions with different profiles of water vapour and clouds. Changing the water vapour factor actually has a much larger effect than changing the CO2 concentrations. Current concentrations of CO2 are 375 ppm. One can also calculate the temperature rise caused by doubling current levels of CO2 from 375 ppm to 750 ppm. We do this by adjusting the Earth’s temperature as input to MODTRAN to give the same net radiated IR energy in watts/sqm as we had at 375 ppm. This is because we always need to balance the incoming solar energy against outgoing IR energy form the Earth at a given temperature and the solar energy doesn’t change. The temperature rise varies slightly from the Tropics to the Arctic and on whether we include clouds or not. However the temperature rise that results varies from about 0.7 to 0.8 degrees C. This is nothing like the predictions of the IPCC which talk of 2.5 to 7 degrees heating but more about that later. Similarly we can use MODTRAN also to estimate the total greenhouse effect of CO2 on planet Earth. i.e. how cold would it get if there were no CO2 at all in the Earth’s atmosphere ! The results are surprisingly little change in my opinion. The temperature would fall between 5 and 7.5 degrees C i.e. about the same change seen between the Ice ages and inter-glacial warm periods. How can that be ? The main answer is that the most important greenhouse gas is water vapour and the temperature regulation of the Earth depends far more on small changes in water vapour than on big changes in CO2. A rise in temperature causes more evaporation from oceans leading to further warming by increasing concentrations of water vapour. 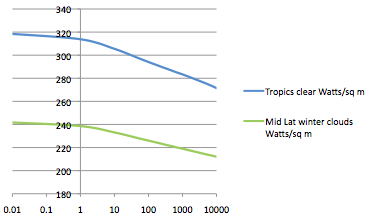 In fact MODTRAN demonstrates that increasing water vapour by just 10% leads to as much warming as doubling CO2 ! Of course the opposite is also true. A warming Earth leads to melting of the ice caps leading to a decreasing Albedo (solar energy reflection) leading to more absorbed energy leading to a warmer Earth surface. A rise in temperature of the ocean leads to a drop in CO2 take up because less can be dissolved as temperature rises. However an opposite effect to this for increasing CO2 is that the biosphere will absorb more CO2 as plants and plankton grow faster. This feedback of the carbon cycle with temperature is called gamma (ppmv increase in CO2 per degree C) and is usually assumed to be a positive feedback. It can be adjusted to give big increases in temperature. If we define gamma to be the increase in CO2 (ppm.v) for each degree rise in temperature then plugging large values into climate models lead to much higher temperature rises. Hanibal’s crossing of the Alps with elephants in Roman times was only made possible because of less glacial ice then. Discovery in the high Italian Alps of a stoneage warrior frozen in snow and only uncovered recently. Why ? – because there was less glacial ice cover then when he died. Viking settlements in Greenland in the middle ages when there was less ice and more arable land These were later abandoned during the little ice age. The carbon cycle feedback parameter gamma has recently been pinned down in a paper just published in Nature by analysing past pre-industrial climates. Their best estimate is 7.7 ppm per degree C, but could even be as low as just 2 ppm per degree C which is almost insignificant. This gives at least 80% less potential amplification than some values used by the IPCC which are around 40 ppmv per degree C.
Adding CO2 to the atmosphere follows a law of diminishing return for warming (logarithmic). Doubling CO2 from current levels would lead to a direct warming of about 1 degree. Positive feedback effects have been exaggerated. There are no tipping points, since if there were they have already occurred in the Earth’s long past history. Reducing dependency on fossil fuels is a good thing. Reducing environmental degradation is a good thing. Reducing air pollution is a good thing. These should be done anyway and not because of climate change. By over-exaggerating the effects of climate change the IPCC risks a huge backlash by the public when these effects don’t come to pass.